We have two sets of ingredients to look at, since this is a two-step treatment. 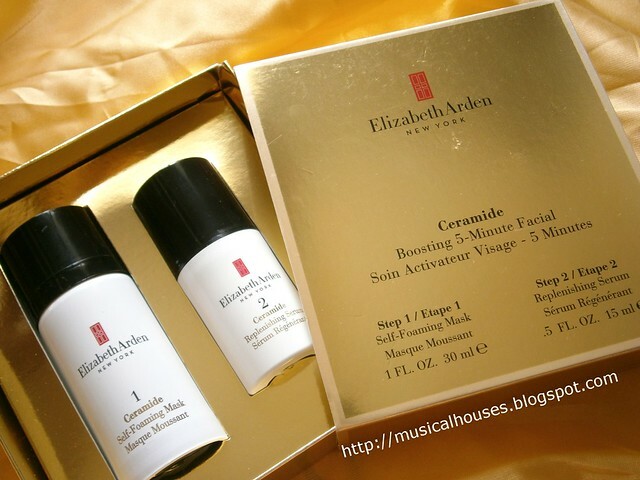 I know I usually analyse the ingredients first, and then talk about my personal experiences with the product, but for the Elizabeth Arden Ceramide Boosting 5-Minute Facial, I'll also weave in my experiences with the product together with the ingredients analysis, so that the post can be shorter. (After all, this is a two-step product, so it's almost like I'm reviewing two products at the same time.) 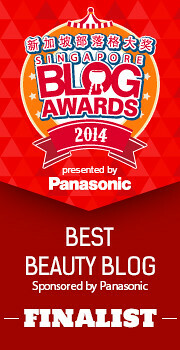 So, let's look at the first step, the Ceramide Self-Foaming Mask. 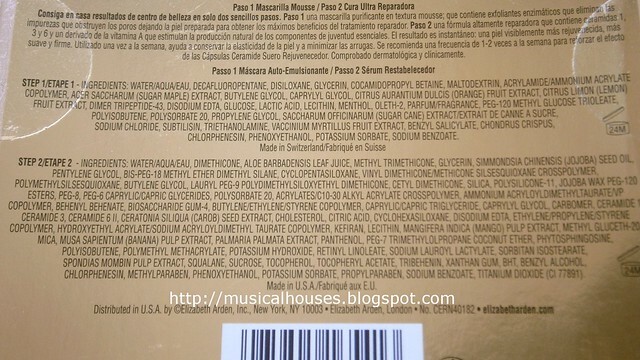 What do the ingredients say, and what was it like when I used the product? The Ceramide Self-Foaming Mask is an interesting one, and contrary to its name, there aren't any ceramides in the mask (which is fine, because it's a rinse-off product, anyway). It's supposed to help exfoliate your skin, but there aren't any physical exfoliating bits or beads inside, so this means that it would be exfoliating by chemical means, which in this case, would mean some sort of acid. The common ones are AHAs (Alpha-Hydroxy Acids), such as glycolic acid, and sometmies BHAs (Beta-Hydroxy Acids), such as salicylic acid. Interestingly though, the Ceramide Self-Foaming Mask doesn't seem to contain any major acid - the only acid that comes up is Lactic Acid, which, if you want to use it as an exfoliant, is very, very gentle - definitely not the kind of "facial"-strength they use in spas and salons. When I asked about the Elizabeth Arden trainer how this Mask would exfoliate skin when I couldn't see anything vaguely acidic on the ingredients list, the response was that the 5-Minute Facial relies on the acids found in fruits for their exfoliating power - and indeed there are a bunch of fruit extracts in the ingredients list, with Citrus Aurantium Dulcis (Orange) Fruit Extract and Citrus Limon (Lemon) Fruit Extract being the two main ones, along with Saccharum Officinarum (Sugar Cane) Extract and Vaccinium Myrtillus Fruit Extract. Usually when I see some sort of citrus fruit extract in the ingredients list, it's usually there to scent a product, but in this case, I couldn't discern any scent in the product, so I suppose the fruit extracts contain some level of AHA that might help to exfoliate skin. This means that the exfoliating effect wouldn't be as strong as a more traditional exfoliating peel that used some percentage of glycolic acid or other AHA, but it could work to exfoliate all the same. Added to that is also Acer Saccharum (Sugar Maple) Extract, which is also keratolytic (i.e. helps to exfoliate the skin). Interestingly, when I dug around and did more research, I found that this specific mix of fruit and plant acids was actually sold by cosmetic ingredients and chemicals companies as a mix of enzymes and AHAs to exfoliate skin. For example, ACB Concepts has a product called "ACB Fruit Mix" which actually has the same combination of fruit extracts: Vaccinium Myrtillus Fruit/Leaf Extract & Saccharum Officinarum (Sugar Cane) Extract & Citrus Aurantium Dulcis (Orange) Fruit Extract & Citrus Limon (Lemon) Fruit Extract & Acer Saccharum (Sugar Maple) Extract. The ACB Fruit Mix is recommended at use of 1 - 10% in products, and is touted as helping skin to exfoliate itself and increase the skin's own production of collagen and glycosaminoglycan. Combined, this mix of fruit extracts is supposed to provide skin with glycolic acid, lactic acid, citric acid, malic acid and tartaric acid, which are all AHAs of varying strengths. So there you go - the source of the various AHAs and enzymes in the Self-Foaming Mask is actually derived from the fruit and plant extracts! Elizabeth Arden Ceramide Self-Foaming Mask: Instead of using traditional acid outright, this uses a combination of acids found in fruit extract and lactic acid to exfoliate skin. Other than that, the Ceramide Self-Foaming Mask seems to have fairly normal ingredients for a mask. There's Water, there's Decafluoropentane, which is a solvent, then there's humectants (Glycerin, Butylene Glycol, Caprylyl Glycol), emollients and skin-conditioning agents (Dimer Tripeptide-43), and a few silicone and film-forming polymers (Disiloxane, Acrylamide/Ammonium Acrylate Copolymer). Interestingly, a mix of Water, Butylene Glycol and Dimer Tripeptide-43 is sold by Ashland, an ingredients and chemicals company, as an anti-aging product at a recommended use level of 1% in the final product, too. Cocamidopropyl Betaine is there as a surfactant, and it's pretty mild, I may have mentioned before that it's also used in baby shampoos. Maltodextrin is interesting - it's not always found commonly in skincare products, but it could be used here as a skin-conditioning agent and/or film-former. So there you go - it's a fairly solid formulation as far as a face mask goes, even if the exfoliation offered is fairly gentle. The only thing I didn't like in this product was the addition of Menthol - it's probably there for the tingly sensation it gives (which will make you be reassured that your mask is working), but if I'm going to exfoliate my face, no matter how likely, then I don't want Menthol in there, as it could potentially be an irritant in such situations. But it's not a large amount, and it may not be an issue for everyone. 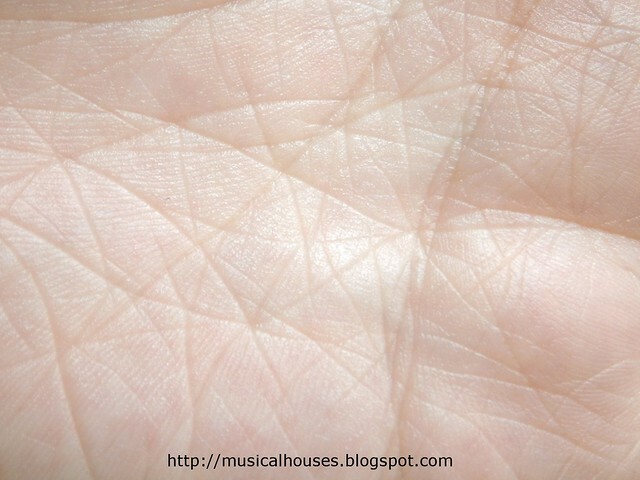 It depends on how sensitive your skin is. Elizabeth Arden Ceramide Self-Foaming Mask: It leaves you with a thin layer of foam on your skin. So, with that in mind, I tried out the Ceramide Self-Foaming Mask. 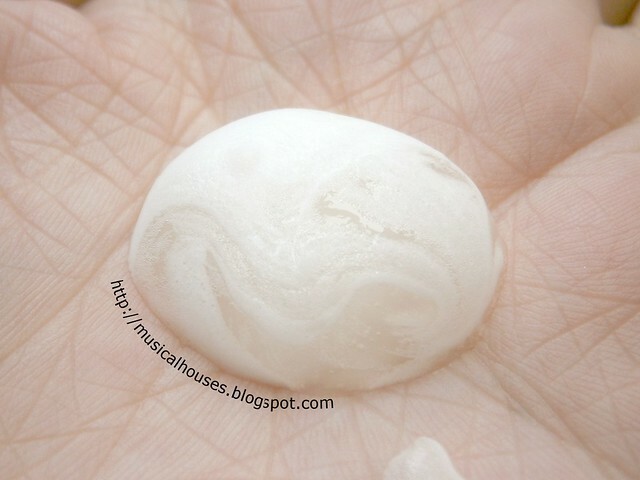 It pumped out of the bottle in a ball of gel, that immediately started foaming and bubbling (you can see this in the previous photo - it does look like a ball, doesn't it?). One pump was enough to cover my entire face. 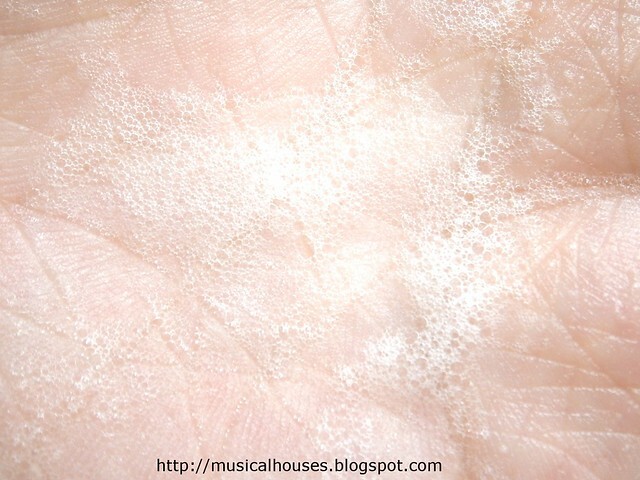 I then quickly covered my face with a layer of the mask, and after awhile, my skin was covered in a thin layer of fine foam (like in the above photo). During the first minute or so, I had a tingling feeling on my face, which I guess that in addition to the AHAs and enzymes, was also partially due to the Menthol in the product. 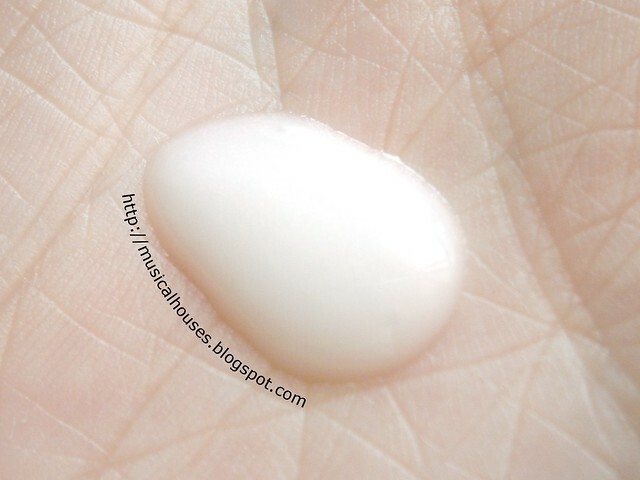 After awhile, this foam slowly disappeared, and all that was left on my skin was a thin, transparent film (as you can see in the photo below), thanks to all the film-formers in the product doing their job. This film is pretty easy to wash off the skin, and when I washed it off, my skin felt nice and clean and smoother. It did feel better overall. Elizabeth Arden Ceramide Self-Foaming Mask: After the foam dies down, what's left behind is a film that is easily washed away. Now that we're done with the Self-Foaming Mask, let's move on to the Ceramide Replenishing Serum. 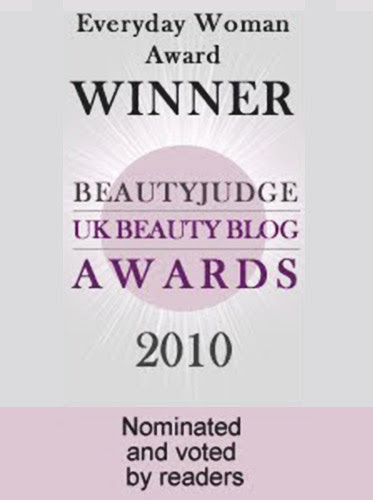 This has ingredients which would be pretty familiar to you if you've been reading my blog, or my previous Elizabeth Arden reviews. 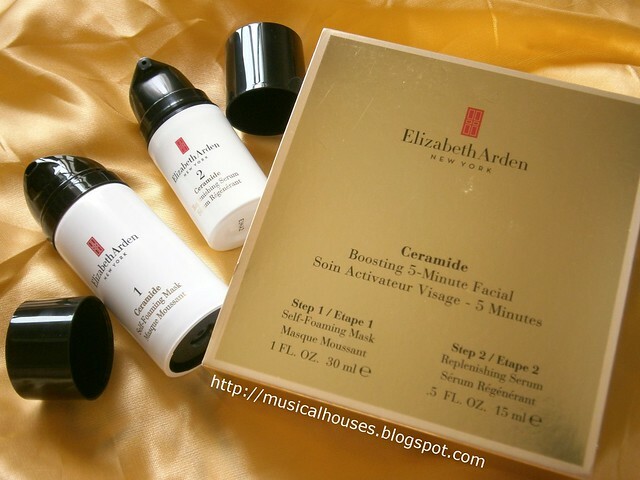 Elizabeth Arden Ceramide Boosting 5-Minute Facial: The second part is the Ceramide Replenishing Serum. The Ceramide Replenishing Serum has Water, humectants (Glycerin, Pentylene Glycol, Butylene Glycol, Caprylyl Glyco), emollients (Simmondsia Chinensis (Jojoba) Seed Oil, Caprylic/Capric Triglyceride, PEG-18 Methyl Ether Dimethyl Silane, PEG-6 Caprylic/Capric Glycerides), silicones, some of which also serve as emollients (Dimethicone, Methyl Trimethicone, Cyclopentasiloxane). There's also the significant inclusion of Aloe Barbadensis Leaf Juice, which is a skin-conditioning agent, and also useful for soothing skin, which is pretty nifty after the Mask. There are also polymers which serve as film-formers (Vinyl Dimethicone/Methicone Silsesquioxane Crosspolymer, Acrylates/C10-30 Alkyl Acrylate Crosspolymer, Ammonium Acryloyldimethyltaurate/Vp Copolymer, Carbomer). These are all pretty useful and typical as far as serums go, and should make a serum that is both humectant and emollient, as well as lightweight. Elizabeth Arden Ceramide Boosting 5-Minute Facial: The Ceramide Replenishing Serum covers all the grounds in terms of humectants and emollients. 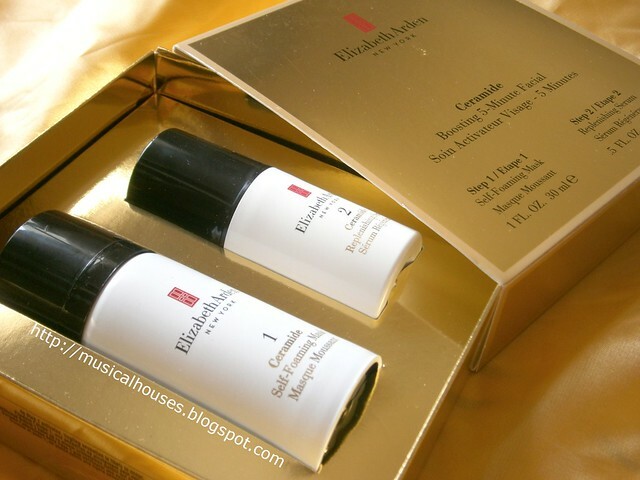 Of course, this being an Elizabeth Arden product, there are also their signature use of ceramides in the product. In this case, the Ceramide Replenishing Serum has Ceramide 1, Ceramide 3, Ceramide 6 II, which are a good mix of ceramides that when applied to the skin, help to allow the skin to increase its ability to hold moisture, and also form a natural barrier on the skin. 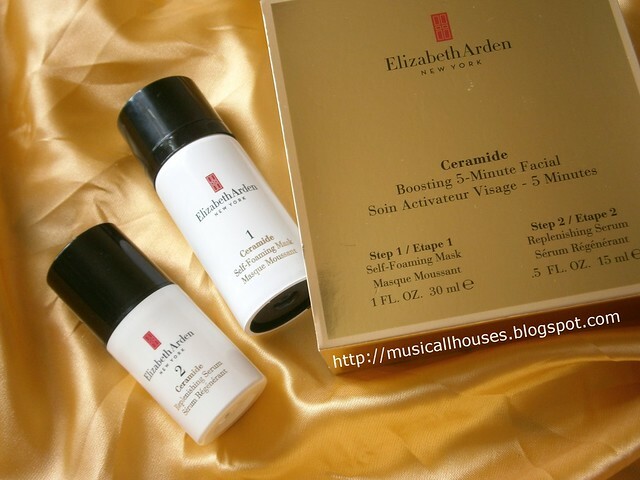 It's good that Elizabeth Arden used a mix of ceramides, because the science literature shows that combinations of ceramides work better than one type of ceramide alone. There is also a synergistic effect when ceramides are combined with fatty acids, cholesterol or phytosphingosine, so it's great to see that Elizabeth Arden has included both Cholesterol and Phytosphingosine too. Also interesting is the addition of Retinyl Linoleate, which is an ester of Retinol (which we all know) and Linoleic Acid, which is a fatty acid, and Sorbitan Isostearate, which is an ester of Sorbitan and another fatty acid, Isostearic Acid. I know esters aren't always the same as their components, but perhaps the fatty acid component of these two ingredients could also help to boost the performance of the ceramides. In any case, what you have is a pretty solid serum with humectant and emollient functions, as well as Arden's classic use of ceramides and synergistic ingredients, that should feel pretty light on the skin. Elizabeth Arden Ceramide Boosting 5-Minute Facial: The Ceramide Replenishing Serum also has three types of ceramides and synergystic ingredients like cholesterol and phytosphingosine. 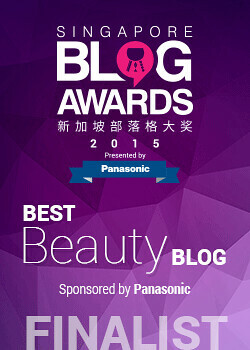 When I used the Ceramide Replenishing Serum, indeed it was quite nice and light on the skin. It's certainly less heavy-feeling than their famous Ceramide Capsules (which are meant for older women with dryer skin), although maybe not as light as their Flawless Future Caplet Serum (which is meant for younger people). So I suppose texture-wise, the brand has aimed for something that's just in-between, making this acceptable to both the older and younger age groups. I liked that it did leave behind a silky feel on my skin but was not too oily or heavy, and after the Mask, this seemed like a nice accompaniment, although I suspect that if I ran out of the Ceramide Replenishing Serum, I could just use either my Ceramide Capsules or my Flawless Future Serum in a pinch as well. After all, both products are also a blend of humectants, emollients, and ceramides with synergistic ingredients, so perhaps the only major thing found in the Replenishing Serum that we're missing out on is the additional skin-soothing properties of the Aloe Barbadensis Leaf Juice. The serum was sufficient on its own for me, and in the hot and humid climate I live in, I didn't think I needed to add another moisturizer on top. If you have dryer skin though, or live in a cold and dry climate, then you might find that you can still apply your usual moisturizer over the top of this serum if it's not sufficient enough for your skin or weather. Elizabeth Arden Ceramide Boosting 5-Minute Facial: The Ceramide Replenishing Serum is a lightweight, easily absorbed white-coloured serum. So, after that long ingredients analysis, and my own personal review, would I recommend this product? It depends on what you're looking for, really. This product has two components, a mask with an exfoliating effect, which is the Self-Foaming Mask, and a serum with ceramides, which is the Ceramide Replenishing Serum. I'd say the Mask provides fairly mild exfoliation, so if you're looking for a super-strength skin-peeling treatment, this is perhaps not your cup of tea. Elizabeth Arden's instructions actually tell you to use the mask twice a week, so that gives you an indication of how mild the exfoliating effect is. On the other hand, if you're looking for a weekly or twice-weekly exfoliation that won't leave your skin red and peeling, then this would meet your needs. The second part of the product is the Ceramide Replenishing Serum, and I'd say this is pretty well-formulated - it covers all the bases one would expect in a serum (has humectants, emollients, is fairly lightweight), and also has a great combination of ceramides, cholesterol and phytosphingosine. 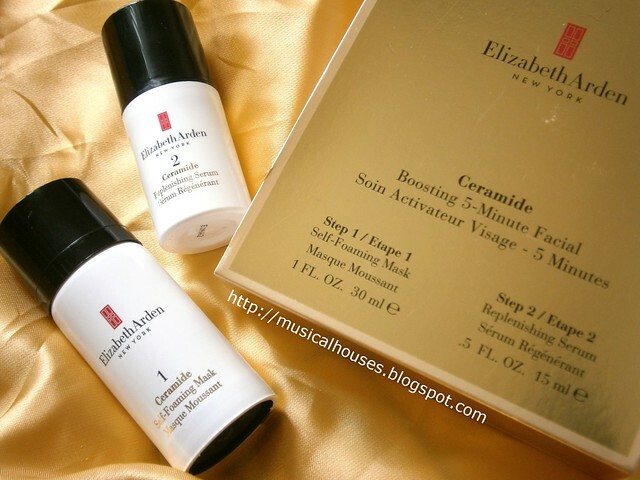 If you've tried other Elizabeth Arden Ceramide products and liked them, then you'd probably like the serum too. So if you are looking for a gentle exfoliant, and would like to incorporate ceramides in your skincare, then this is a good product to try. The Bottom Line: This product consists of a gentle enzyme and AHA-based exfoliating mask, as well as a serum fomulated with Arden's signature mix of ceramides and synergystic ingredients, and would work for those who like skincare products with Ceramides, and want a gentle exfoliant for regular use. The serum sounds amazing! But I'm disappointed the mask contains menthol. I don't want that on my face.